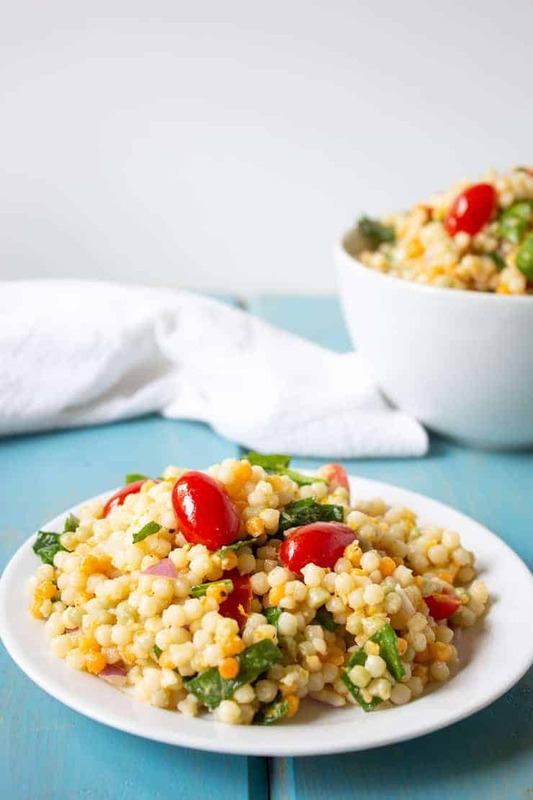 Israeli Couscous Salad with spinach, tomatoes and a light orange dressing. 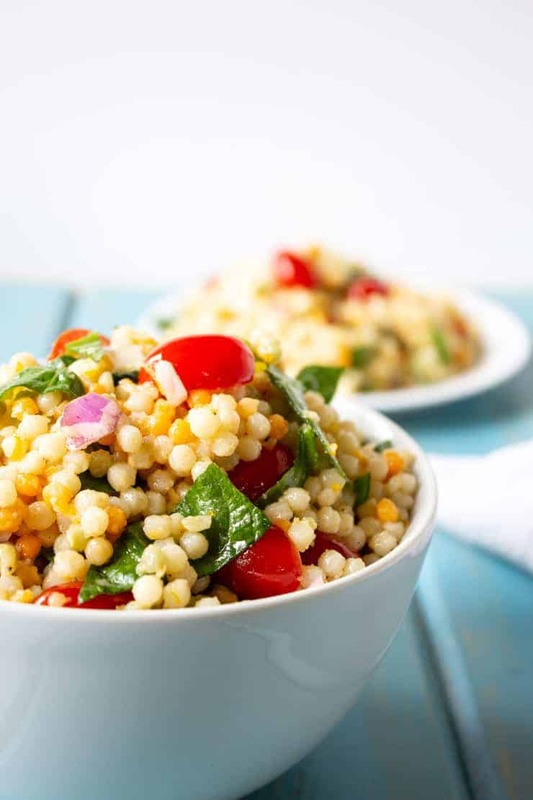 Israeli Couscous Salad is a delicious salad filled with fresh spinach and tomatoes. 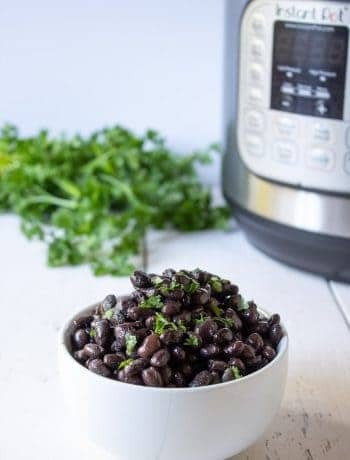 This is a perfect summer salad for picnics, BBQs and potlucks because it travels well and you don’t have to worry about keeping it ice cold. I’ve made couscous salad before but I used the small, traditional sized couscous. This time I used Israeli or Pearl couscous. These are larger in size. I also use a tricolor which adds some fun to the dish. 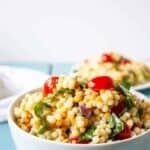 Are there different types of couscous? Yes! There are three main types of couscous. 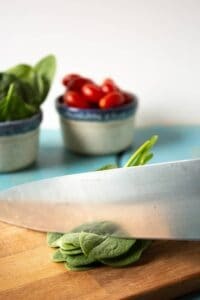 What’s the best way to cut up spinach? I’ve added fresh spinach to this salad. 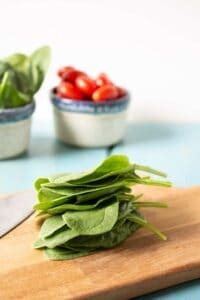 A quick tip to easily cut the spinach is to stack the leaves, then cut into small strips. This makes it easy to cut and keeps the pieces in a uniform size. This salad can be eaten right away, but it really is best after refrigerated and all the flavors have a chance to meld together. 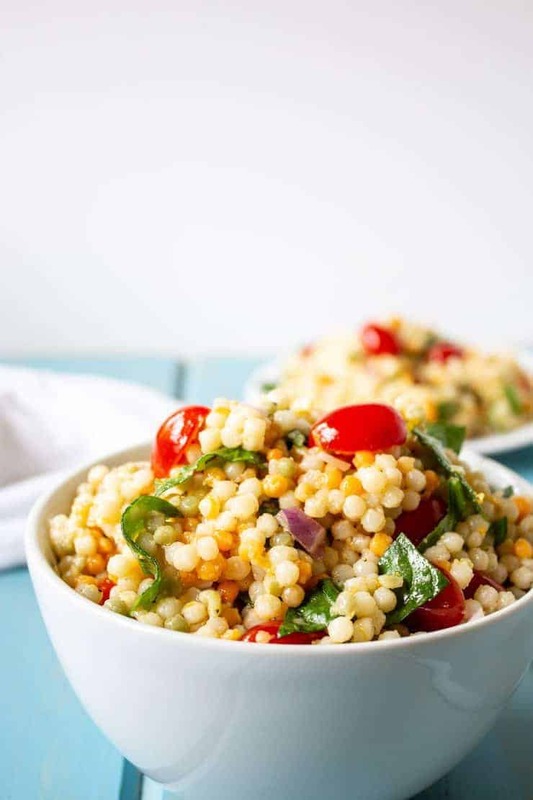 I thought the salad was even better eaten the next day, which makes this couscous salad even more perfect for a summertime BBQ. I love dishes that you can make the day before. 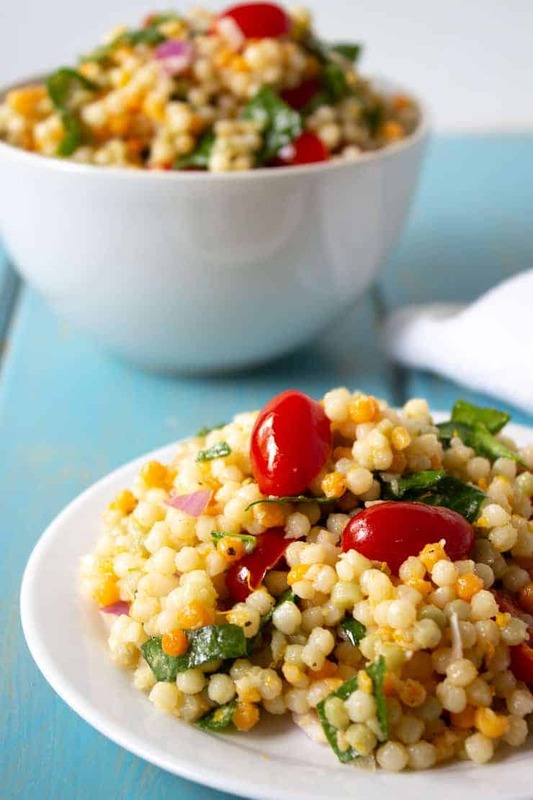 Couscous salad with spinach, tomatoes and a light dressing made with fresh orange juice. Mix orange zest, freshly squeezed orange juice, olive oil, garlic and salt and pepper together. While couscous is still warm, but not hot, pour dressing over couscous. Stir. 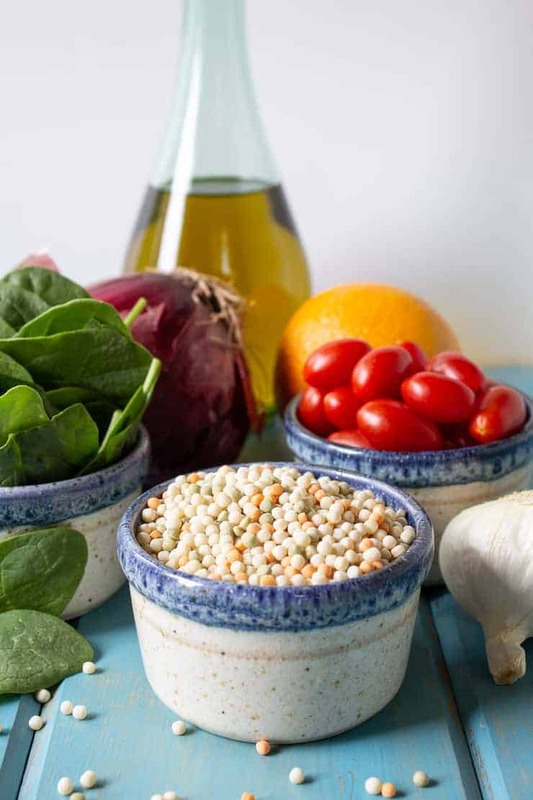 When couscous has cooled to room temperature, add spinach, tomatoes and onions. Stir. Add additional salt and pepper if needed. 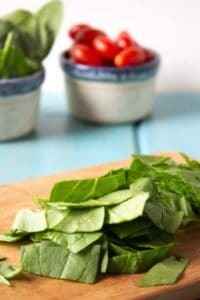 Salad can be eaten right away or covered and refrigerated until chilled. Pinned it right away! Love cous cous and like you, I have only used the regular cous cous. I’m loving this pearl cous cous, and the fresh spinach and tomatoes. 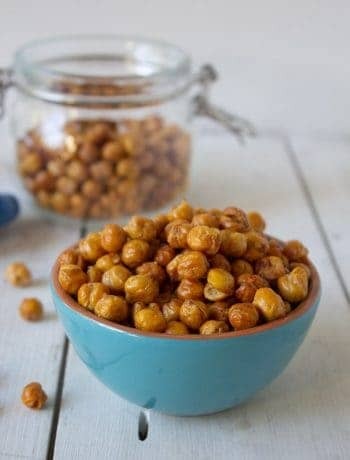 Such a great summer dish! This is the kind of meal that I crave on these hot and steamy days! So fresh! 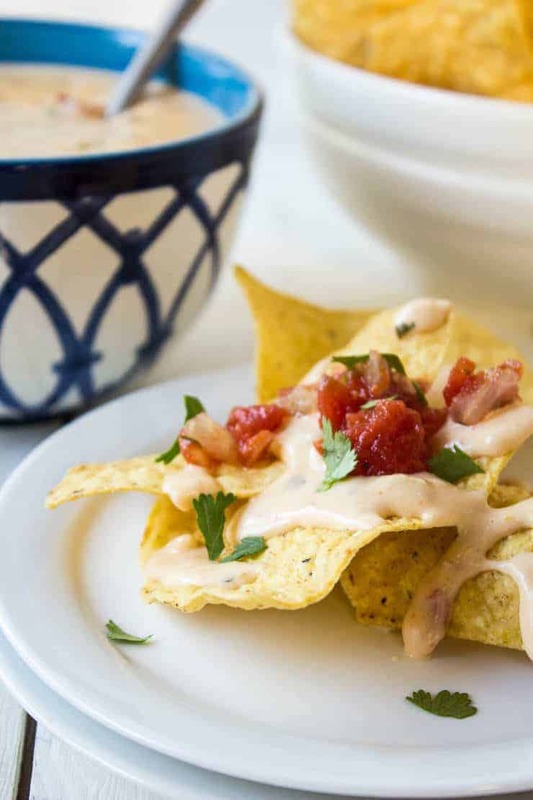 This dish is made for summers! 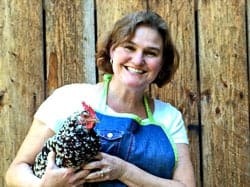 Thanks, Dawn! It is a delicious salad! I love the citrus flavor you’ve got going on in this salad, Kathy! It really does sound perfect for hot summer days. And I love how salads like this actually taste better on the second day. That means we can do the work in advance and then sit back and enjoy it later! 🙂 I need to try this one soon for sure! Nothing better than getting all the work done early, while the days are still cool! This looks so fresh and light for summer Kathy! That orange vinaigrette sounds amazing!